This is another one of the cards that I made using the Mixed Bunch stamp set. I used the stamp set in a little different manner this time. I used the daisy stamp from the set and stamped a white daisy on lucky lime aid, summer starfruit, calypso coral and island indigo cardstocks. I then embossed these flowers with white embossing powder. 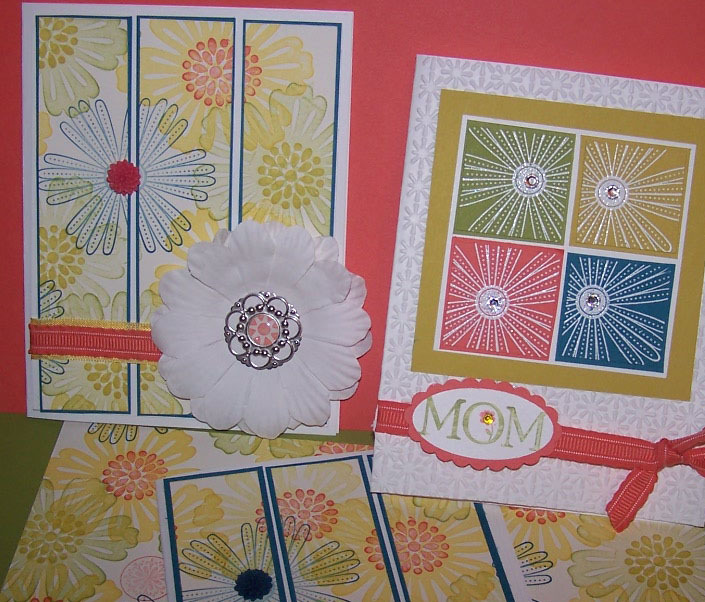 Then I punched out the center of each daisy with the 1 1/4″ square punch. I layered each piece onto a coordinating piece of cardstock punched with the 1 3/8″ square punch. This is layered onto a square of whisper white and then a square of summer starfruit. I emobossed a piece of whisper white cardstock with the petals a plenty embossing folder and added a piece of calypso coral ruffled ribbon. I stamp the MOM in lucky limeade. This is layered onto a white card base. 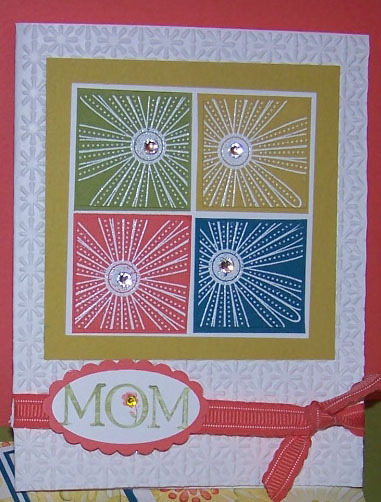 Each of the daisies and the flower in the O of the Mom are embellished with a rhinestone jewel. This card is part of the mixed bunch cards that I designed last week. The directions for these cards are available for $4.95 via paypal. Card kit, card kits, mixed bunch, Stampin' Up!. Bookmark.